India and Pakistan remind me of a couple that have lived together for a lifetime and more. But they have also grown weary of each other. When the British left the Indian subcontinent the main body of land (largely the northwest territory of Punjab) was divided into India and Pakistan. This fragmentation 71 years ago of a people with shared ethos -- land, language culture, cuisine and music -- was cataclysmic. They plundered and killed each other in 1947 as perhaps only Biblical brothers do, and they have waged war on each other thrice along with many a smaller skirmish to sustain their hatred of each other. Keep in mind also that both India and Pakistan are now nuclear powers. Yet, these neighbors love each other; their ties antedate time and continue to bind them. Occasionally they are nice to each other, but mostly they bicker and vilify the other. The religious reality of Sikhi took birth in what is now Pakistan; that is necessarily where we look for the early history, traditions and markers of Sikhi. Not surprising, therefore, that caravans of Sikh pilgrims from across the world, and more so from neighboring India, are anxious to visit Pakistan and reconnect with their history. This has not always been popular with India’s political bureaucracy. They see these visitors (largely Sikh) as possible enemies of India fraternizing with Pakistan -- the enemy du jour. The ethos, cuisine, and language that collectively define all Punjabis, Sikhs, Muslims or Hindus, stoke the politically-driven suspicious mind and spills out onto society. But this year is super-special. 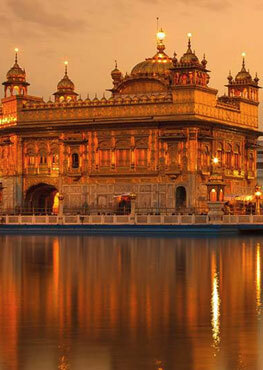 It’s 550 years since the birth of Guru Nanak, the founder of the Sikh faith. The yearly pilgrimage of Sikhs is no longer a trickle but a raging flood. Sometimes, like a bolt of lightning, good sense strikes and jolts us up to the possibilities. 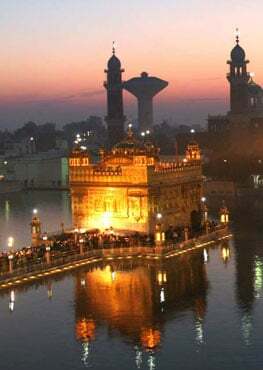 Sparks arose in Punjab, and around the world in the Sikh community that perhaps a Guru Nanak Peace Bridge or Corridor of Peace – a walkway – be demarcated running from the India-Pakistan border in Amritsar (India) to Kartarpur in Pakistan. This tribute to Guru Nanak, the Prince of Peace, could bring a people together -- separated just 71 years ago, like long lost siblings. The movement quickly became a rare but raging fire. For success it required governmental and political vision with will and wisdom in both nations. Such qualities are often in short supply but ultimately will emerge in response to a people’s determined will and vision. At a celebratory meeting/bash (November 2018) movers and shakers along with governmental personnel from both India and Pakistan were in full throated support of the endeavor for this corridor of peace. The most notable voices were two prominent former cricketers who had respectively represented their national teams-- Imran Khan of Pakistan and Navjot Singh Sidhu of India. Both are active politicians in their respective countries Imran is the current Prime Minister of Pakistan. Whether you owe loyalty to India, Pakistan or somewhere else in the world this surely is a matter to celebrate. We welcome it wholeheartedly not for the Sikhs alone who are and will remain a minority no matter where in the world they live, but for the entire globe. I repeat that India and Pakistan, are both nuclear armed nations, and committed enemies who have fought many wars. But political constraints often trump common sense. Much of the Indian Press remains suspicious and dismissive of such peace overtures as a workable goal. Their attitudes and reactions remain disappointing. For instance, the Indian Press castigated Navjot Singh Sidhu when he and Imran Khan embraced at the ceremony. The press is ignoring the place of Sikhs and Punjab during the Freedom Struggle of India as well. This closed mindedness makes me wonder! Have they never seen boxers shaking hands before a fight? Have they never seen dedicated competitors greet each other most cordially in life and death competitions or losers honestly compliment the winners even after a bitter fight? What a pity that they never encountered or learned such spiritual moral values. 1. A popular American idea: Keep your friends close and your enemies closer. 2. War and cruelty are human realities but peace and goodwill, too, are supreme human traits and aspirations. Perpetuating a zero-sum game – a losing proposition -- ultimately helps no one. The idea here is to evolve in a direction such that enemies become participants and partners in progress.